If you lead a team of project managers or schedulers in the pharmaceutical industry, you know how critical effective plan communications can be. Delivering just the right amount of data to the right stakeholders at the right time is a winning recipe for hitting deadlines and building credibility for your project management office (PMO) — especially when you’re responsible for the delivery of myriad projects across multiple clinical areas. Any project management supervisor worth his or her salt knows that showing project data visually — usually in the form of a Gantt chart or birds on a wire timeline summary — is the linchpin of any effective plan communication strategy. Human beings are visual learners, after all; an effective graphic will always deliver more information more quickly than a spreadsheet or spoken presentation. In this article I examine why this is and show how to capitalize on it. Communication is at the heart of every successful pharma PMO. Nearly everyone at your company — from the C-suite and knowledge workers developing new drugs and therapies to other project and portfolio managers — needs regular updates about where discrete initiatives stand. This allows for contingencies to be created when slight slippages occur, as well as the identification of potential synergies between teams and departments. Universal understanding. Presented graphically, time always flows left to right; left is “before,” and right is “after.” Thus, in a visual it’s extremely easy for viewers to track the path of any particular project or task from early stages to completion; they simply read left to right. This is far more natural than raw cell data from Microsoft Project or Excel, which tends to be presented vertically. Emphasis on key data. In a timeline graphic, icons can be added to show key milestones or deadlines that absolutely cannot slip. Since they’re shown in a greater context, such indicators carry significantly more weight than just another date to be added to a calendar. Other visual cues, such as percent complete indicators, add more data in a way that’s instantly accessible and understandable. Task grouping. Separating a chart into swimlanes is an ideal way for your team to present simultaneous data on multiple tasks or projects within your portfolio. Since the timeline is the same for each, such a view can show stakeholders how tasks are dependent upon one another, or when a particular group might have excess bandwidth. Items can be sorted based on clinical area, national drug code or any other criteria. While aesthetically pleasing charts are great, the integrity of underlying data is absolutely critical in a pharma setting. The old industry chestnut is that a delay in bringing a new product to market costs a company a million dollars a day. With such high stakes, mistakes are not an option. If your team is creating its project visuals by hand in PowerPoint, there’s little insulation from human error; any change to data in the source application — Project, Excel, etc. — must be adjusted by hand in the visual. Without a firm link between the raw project data and the visual, the reliability of your team’s graphics is always in question. As a result, many pharma organizations are turning to data visualization tools that integrate directly with project management software. Tools such as ours, OnePager, use project information from the system of record to instantly create accurate visual timeline summaries. While the resulting graphics can be customized from a visual branding standpoint, the most critical pieces of information — dates and task status — can only be changed in the source application. Project management leaders at pharmaceutical organizations do yeoman’s work. Responsible for the successful delivery of multiple projects across many clinical areas, they need to ensure their teams have the tools necessary to gain alignment and buy-in from all stakeholders and identify potential problems before they become critical issues. Communicating plan information visually is an ideal strategy for accomplishing these goals. 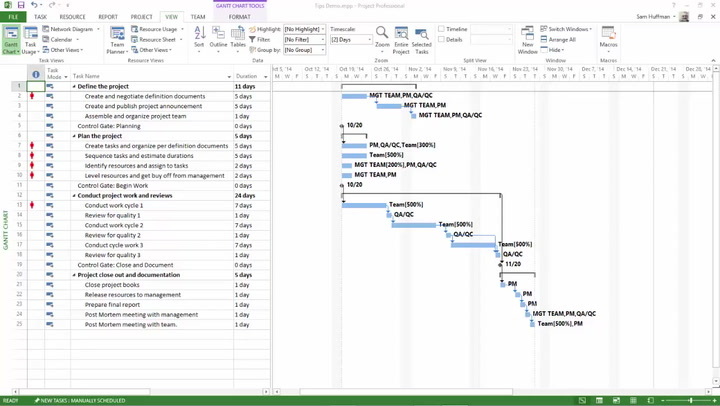 By identifying and deploying a tool that allows project managers, schedulers and scientists to quickly and efficiently craft Gantt charts and other timeline summaries based on real project data, PMO leaders can help ensure their departments’ success in meeting their most crucial goals. OnePager is project timeline software built to integrate directly with Microsoft Project and Excel. Learn more about how OnePager is used in the pharmaceutical industry, or start your 15-day free trial today! A version of this article originally appeared on the OnePager blog here.